For adjustable frequency drives, the program automatically assigns the names AFD-1, AFD-2, AFD-3, and so on. ID name of the bus on the input side of AFD. The base kV of the bus is shown on the right. ID name of the bus on the output side of AFD. The base kV of the bus is shown on the right. Input AC Frequency The fixed frequency on the input side. This is specified in the System tab of Options dialog box. Output AC Frequency The adjustable frequency on the output of the AFD. This affects the frequency of all equipment connected on the output of the AFD. Rating Rated Input kVA or the motor HP of the drive. X/R If the AFD is regenerative, this value is used to define the short circuit X/R ratio of the contribution delivered at the input of the AFD. The Calculate button uses an ANSI standard lookup table to fill in this value. PF The input power factor of the AFD for power flow simulations. Efficiency The efficiency of the AFD. This creates a real power increase from the output to the input of the AFD. Diode / IGBT This is currently IGBT only. 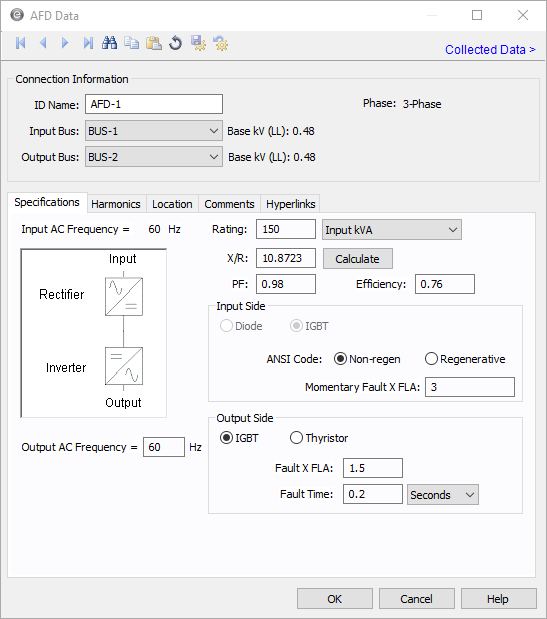 ANSI Code Select Non-regen to simulate a non-regenerative drive and Regenerative to simulate a regenerative drive (which includes a short circuit contribution on the input of the AFD). Initial / Momentary Fault x FLA The defined bolted fault level for the input of the AFD if it is regenerative. 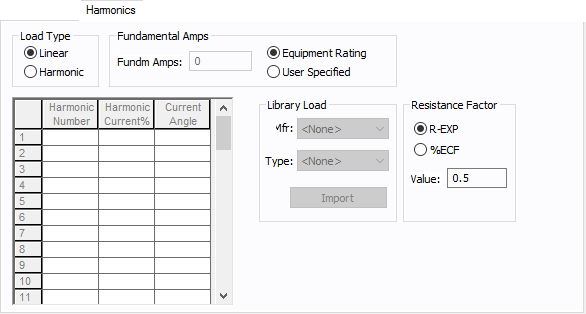 The label displayed is based on the IEC or ANSI option selected to Tools > Options. IGBT / Thyristor Select IGBT to model a source inverter on the output, or choose Thyristor to model a Thyristor output. This currently does not affect any calculations. Fault x FLA The fault current output of the AFD under a bolted fault condition.